Located off the strip on West Flaming Road. The casino has 95,000 square feet with 2,200 slot video poker and machines, table games, two high limit areas, classic poker room, keno lounge. The casino also has a poker room. The resort's dining options are equally extraordinary, from Aliz�, where diners can enjoy floor-to-ceiling views as well as gourmet meals, to Little Buddha, with its crimson, gold and celadon decorations and giant Buddha statue. 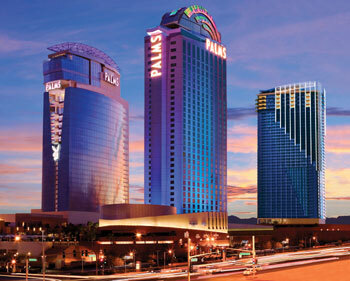 Palms features a 20,000-square-foot spa boasting numerous services. Outside, the pool provides a welcome reprieve from the Vegas heat with multiple pools, including two designed just for shallow lounging.